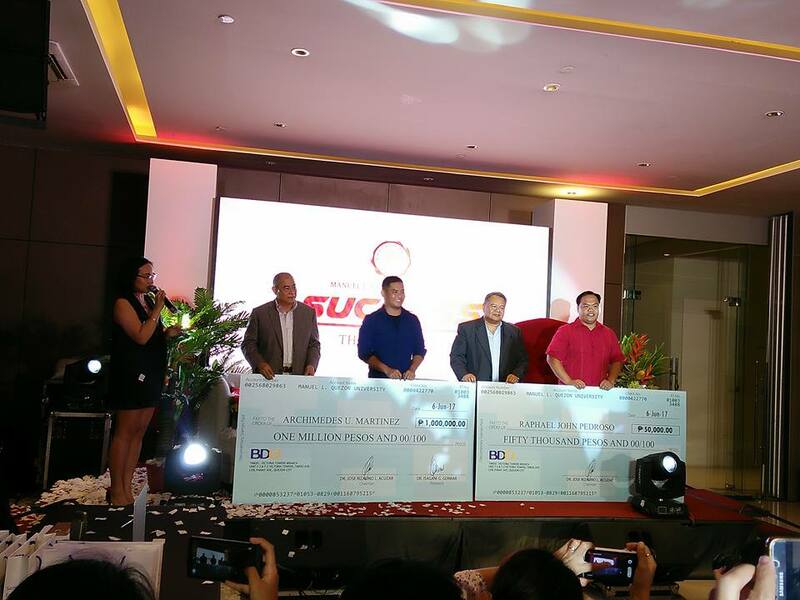 For the first time the Manuel L. Quezon University (MLQU) gave one (1) million cash reward to its board passer (top 8). In recognition and appreciation for ranking Top 8 in the recent nationwide professional licensing exam for Civil Engineer, Mr. Archimedes Martinez receives whopping Php1,000,000 as his token. Engr. 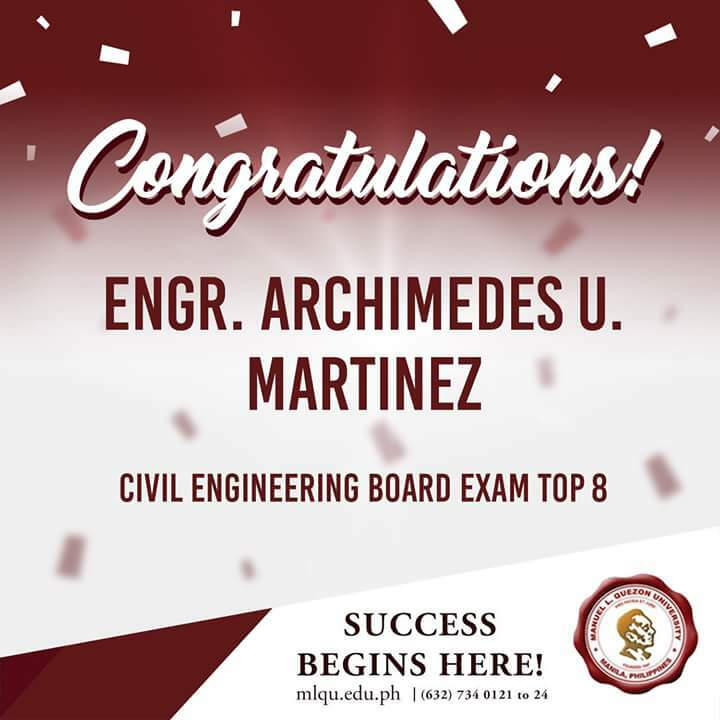 Martinez, a BS Civil Engineer graduated from Manuel L. Quezon University, ranked 8the with a rating of 92.65 percent based on results posted by the Professional Regulation Commission (PRC) last May 11, 2017. With this achievement Martinez has brought honor and pride to his alma mater. And in return, MLQU celebrates this victory through Success the MLQU Way event by rewarding him one (1) million pesos and job offer from New San Jose Builders, Inc. (NSJBI). The event was also a celebration of the success and achievement of MLQU graduates who have exhibited exemplary performance during the recent Board and Bar Examinations. Together with Mr. Martinez, Mr. Raphael Pedroso was also awarded fifty thousand pesos for having a total average of 93.25% in the recent nationwide professional licensing exam for Civil Engineers. This is MLQU's way to motivate its aspiring students to be committed and to continue to strive for excellence. MLQU will continue to hone individuals who are capable of producing exemplary and notable works. During the early years of MLQU, the university is known to produce high caliber graduates, some of which are bar topnotchers who are now experts and pillars in various industries. And as the year passed, MLQU had its fair share of trials and challenges that it had to surpass to keep its noatable reputation. In 2014, the New San Jose Builders Inc. acquired MLQU which ignited a vision of getting back on track and building the culture of excellence and legacy of becoming an outstanding academic institution. Since then MLQU , under the new management, has been very committed in regaining its glory. MLQU is continuously beefing up its roster of faculty members and deans who are known practitioners from their respective industry. Adding to the list of MLQU notable deans are former Chief Justice Reynato Puno, Regent & Dean Emeritus College of Law; former Supreme Court Associate Justice Jose Perez, Dean School of Law; Professor Eric Soriano, Dean School of Accountancy, Business and Real Estate Management; and DPWH Undersecretary Raul Asis and former UP Dean of Architecture Danilo Silvestre, special lecturers to name a few. Alongside the enhancement of MLQU facilities and faculty, the basic education program for kindergarten to senior high will be offered at MLQU Space this June.